The natural history of this species is linked to the Southern Hemisphere’s trade winds (‘alisios’ for Spanish speakers), which blow from the southeast to the tropics. In the South Atlantic, trade winds sustain the Benguela Current, the waters of which surface from some 300 m of depth and fertilise the marine ecosystems stretching from the Western coasts of South Africa to Angola (8). Left panel: Migratory movements (colours) of 54 satellite-tracked juveniles of jackass penguins (Spheniscus demersus) between their natal colonies (circles) and feeding areas (vertical bars) (7). Young birds from the Atlantic Ocean colonies (Western Cape) consistently migrate to the north, and those from the Indian Ocean colonies (Eastern Cape) migrate to the west. Right panel: Demography of breeding pairs, where points represent annual numbers of pairs, and lines are projections based on survival rates accounting or not for an ecological trap. 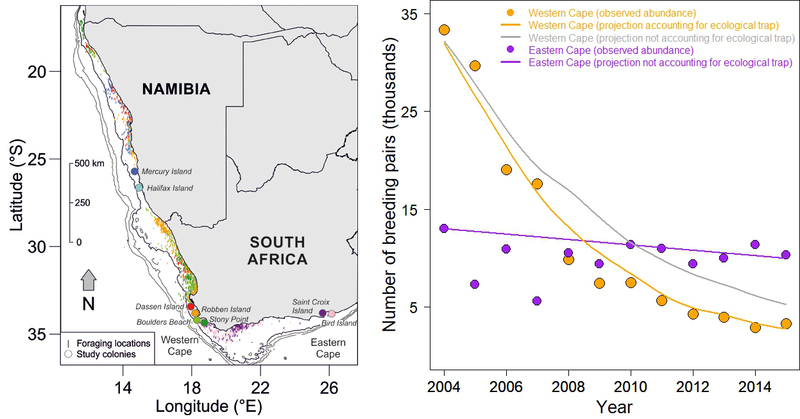 Projections support that hypothesis that reproductive pools west and east of the Cape Agulhas have declined, although only in the former is an ecological trap operating. Many areas along the Benguela Current are experiencing a surprising spatial uncoupling between phytoplankton and planktivorous fish (9). When pilchards and anchovies attain reproductive age, they seem to migrate southwards to spawn in the warmer (and warming) waters off Cape Agulhas (10, 11); yet, penguins do not follow their prey. Fish stocks north of the Benguela Current have not recovered from overfishing that peaked in the mid-20th Century, the ecosystem having undergone a gradual ‘jellyfication’ whereby jellies replaced fish as the predominant pelagic fauna (12); yet, penguins keep migrating to this area now mostly devoid of their prey. Both overfishing and prey migration to warmer waters could have created an ecological trap** (13, 14) for jackass penguins in that their postnatal migration might be responding to an environmental signal that is no longer associated with the abundance of their prey. What could that signal be? Adult jackass penguins are mainly visual hunters of fish schools (see fishing footage here). In contrast, and like many Procelariiformes (15, 16), penguin juveniles could also be guiding their migration by olfactory cues, so preferring areas with high concentrations of dimethyl sulphide (17): a chemical compound smelling very much like a clam display in the local fish market. The compound is released by phytoplankton as they are grazed by zooplankton. This begs the hypothesis that young penguins might smell the phytoplankton, and relate it to potential prey, which are no longer numerous. Meanwhile, adult jackass penguins do not fall into this hypothetical ecological trap and consistently forage in (18), and exclude juveniles from (19), prey-rich waters — perhaps because they store geographical feeding information in their spatial memory accumulated over the full life cycle (see a review about this theme in reference 20). A synergy between overfishing and climate change has exacerbated the variability of the marine ecosystems in the Benguela Current (10, 21). There (like in the other main fishing areas worldwide), forage fish is one of the most heavily exploited marine resources (22), and a key component of marine food webs. Forage fish comprise pelagic species of gregarious and small-bodied crustaceans and fish, like krill, sardines and anchovies. They amount to one third of the global fishery catch, of which one third is destined for human consumption, while the rest goes to feeding livestock (23) and is also exploited as fish bait, fertilisers, and food for farmed fish and pets. The reality is that many marine predators, like penguins, might be having their reproductive success compromised by competing with humans for resources such as forage fish (24), and this competition is doomed to strengthen in the future. While our society has exceeded the limits of sustainable fisheries (25), overfishing (see popular-science video here) is not, and will not be, alien to climate change. Thus, current predictions estimate that fish catches are bound to decline by three million tonnes with each one degree of warming (2). That is a lot of fish considering that the current annual fishery catch totals > 80 million tonnes globally*** and keeps diminishing (27). It sounds trivial to end this blog by saying that natural resources are limited, and limiting, for so many mouths. *Original Spanish lyrics: “… yo estaba empeñado en no ver lo que vi, pero a veces la vida es más compleja de lo que parece …”. Full song available here. **Ecological traps in simple words explained here and here by Bruce Robertson. ***Per capita human consumption of fish recently estimated at 20 kg/year by the United Nation’s Food and Agriculture Organization/FAO (26).